​To protect your school in the fastest and most secure way possible. School lockdowns are scary. What's even scarier is that the locks that should be protecting our children and teachers could put them at risk. Right now there are locks installed in schools across the nation that require teachers to step or reach outside their classrooms to lock their doors during a lockdown situation. With an active threat on campus, schools need to be locked down as quickly as possible. The 123 Lock-Down Latch can do this in seconds. There is no need to find keys or leave the classroom, keeping everyone safe. 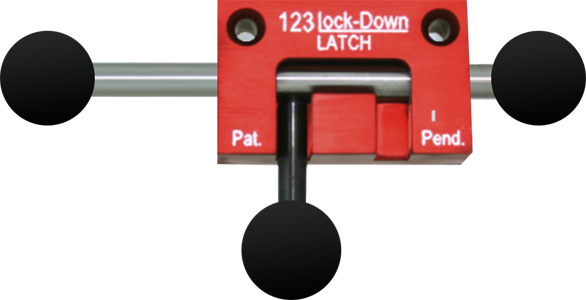 The idea for 123 lock-Down Latch was born of Cory Webster’s realization that his wife--a teacher--and her students would be in an extremely vulnerable position in the event of a real lockdown on campus. Working in maintenance at a local school district, Webster installed 1,800 of a flimsy product the district purchased. There were so many faults with this product, Webster developed his own. To date, 6 districts have now replaced the same flimsy product with the 123 Lock-Down Latch. As a class B general contractor, Webster built his Latch to last. To use the 123 Lock-Down Latch, a teacher simply slides a lever that shifts a bumper to prevent a locked door from closing. When a lockdown occurs, the teacher can slide the lever back, and the door closes and locks. There is no need to find keys or leave the classroom to secure the door. An added benefit of the Latch is the fact that teachers use it every day, so it becomes a part of their daily routine. When an emergency occurs, teachers know exactly how to use it because it has become second nature. We believe devices that barricade doors can put students and teachers in danger because there is a chance they could be trapped in with a perpetrator. If this happens, there is very little first responders can do to get help to them. Barricaded doors also violate various safety and building codes. The 123 Lock-Down Latch was developed with egress, IBC, and fire codes in mind.